Baader U-Filter (Venus and UV) 350nm. Transmission peak approx. 80% at 350nm, bandwidth 60nm (320-380nm), completely blocking the entire spectral range from 200nm to 1120nm. Dielectric multi-coating on optically polished Schott Glass. Enables imaging in the deep UV spectral region. A "breakthrough" for imaging the planet Venus! Allows amateur astronomers to capture cloud structures of the Venusian atmosphere. Successful astro-application of this filter requires a suitable UV-sensitive lucky imaging camera module (i.e. SKYRIS 274M) with at least a telescope of 5" diameter (a telescope with an 8" diameter is recommended). Could I have a 1" UV-Venus (350nm) filter custom made? I am looking for Baader Planetarium Ultraviolet Venus filter. I s this the same as U-Venes Filter? I will be using it for UV reflective photography. I'm using a Nikon D70 camera with a 55 mm Nikor lens to be attached to the nikon base. Which attachment do I have to buy? I have step up and step down converters. Would those work? I use 52mm filters (IR pass as well as UV-IR block) with the same lens. Please let me know ASAP. Also how much would delivery cost and the amount of time taken to send to Melbourne Australia? Yes, the U-Filter is the Ultraviolet-Filter, which only transmits UV radiation. For shipping to Australia, please contact Extravision.com.au, our Australian distibutor. Our local distributors have spend a lot of time to present our products in your language, and can give you faster delivery times and service in your country than we can from Germany. Is it possible/adviceable to stack two of those filters to achieve even more suppression of VIS/IR-leakage? I.e. for applications different than astronomy? Will there be multiple reflexions or similar effects? As you can see, there is almost no transmission in VIS and ca. 75% in UV. If you stack two filters, your main problem wouldn't be reflections, but the lack of light (especially as most cameras aren't optimised for UV sensitivity). Leakage in VIS should be no problem for all typical exposure times. But the filter comes in a standard filter housing and can be combined with other filters. Would it be possible to custom order this filter in 77mm threaded for DSLR lens filter? 1. Can I mount Baader U-Venus Filter on Canon EF 50mm f/1.8 STM Lens which has a 49mm thread? If I can, which attachments should I buy? 2. Can I take UV portraits of peoples faces with a Canon T1i (converted to full spectrum) + Canon EF 50mm f/1.8 STM Lens + Baader U-Venus filter? If the built-in UV/IR-filter of your camera has been removed, then the sensibility in UV depends only on the UV-transmission (and sharpness) of your lens in UV. You'll have longer exposure times, as only the blue-sensors of your colour-camera will receive light, but it should not be worse than e.g. infrared-photography. A non-modified DSLR (with the UV-filter still inside) will not work. Baader U-Filter (Venus and UV) 1¼" and 2"
Baader U-Filter with a Transmission peak approx 80% at CWL 350nm , bandwidth 60nm (320-380nm), with complete blocking of the spectral range from 200nm to 1120nm. Dielectric multi-coated coating on optically polished Schott glass UG-11. Enables shooting in the deep UV spectral region; a wavelength range that was previous inaccessible for amateur astronomers. The Solar Calcium K-Line also is within the passband of this filter. The Baader U-Filter was created for imaging Venus with a webcam, CCD and CMOS cameras. Using the filter for visual observations is impossible due to the eye's insensitivity to this spectral range (UV). UV sensitive imaging camera such as the SKYRIS 274M with at least a telescope of 5" diameter. A telescope with 8" diameter is recommended. Single Shot CCD are not suitable for use with the U-Filter. The planet Venus is surrounded by a closed cloud cover, which moves at high speed around the planet. Here, different cloud bands, which show a steady change of details form similar to the cloud cover of Jupiter. Unfortunately, these clouds can not be seen in visible light, unlike Jupiter, meaning Venus appears completely structureless. However, by using a camera that is sensitive to inaccessible wavelengths unlike the eye, this cloud structure detail can be seen, in particular using ideal wavelengths in UV range between 320nm and 390nm. Since the early days of amateur astronomy, amateurs have been trying to work in this light. The difficulty is procuring a suitable filter to work precisely in this short wavelength region adequately. A sharp short-pass filter with high transmission is virtually impossible to produce. This also applies, surprisingly, to interference filters. While a theoretically ideal UV bandpass can be produced, there is inevitably at least one second passage window in the visible range. This is fatal because this undesirable area cannot be blocked with coloured glass. In such a case you would need again an ideal short-pass filter, which again is not produced in sufficient quality. Amateurs have tried with modest success to create a filter for stacking one UV passage without a second passage area. This meant a strongly reduced contrast and modest transmission, which is not ideal. Those who believe you can make do with a less transmission filter are soon disabused. In addition the glass of many telescope optics in the UV have a much lower transmission, which does not help. The good idea of using an excellent UV-interference filter with a second window in the visible light, and evaluate only the blue channel in the resulting images of the colour camera used of course does not either. The filter on the semiconductor is subject to the same problems mentioned above. Also the blue channel gets light from the other channels added to it. Since the semiconductor is not very UV sensitive, the low leakage of the visual light tends to be shifted to the UV. 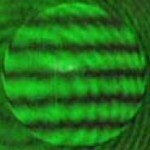 This double image show significantly the effect of refraction and can make the UV detail inaccessible due to this inefficient rejection of light outside of the 320-390nm spectral range. With the latest dielectric coating technology, it is possible to achieve an ideal UV characteristic with the highest transmission while blocking other transmission windows. This has made it possible for the first time for an amateur astronomer to photographically observe the changing clouds of Venus and to say goodbye to the vacuous white crescent. 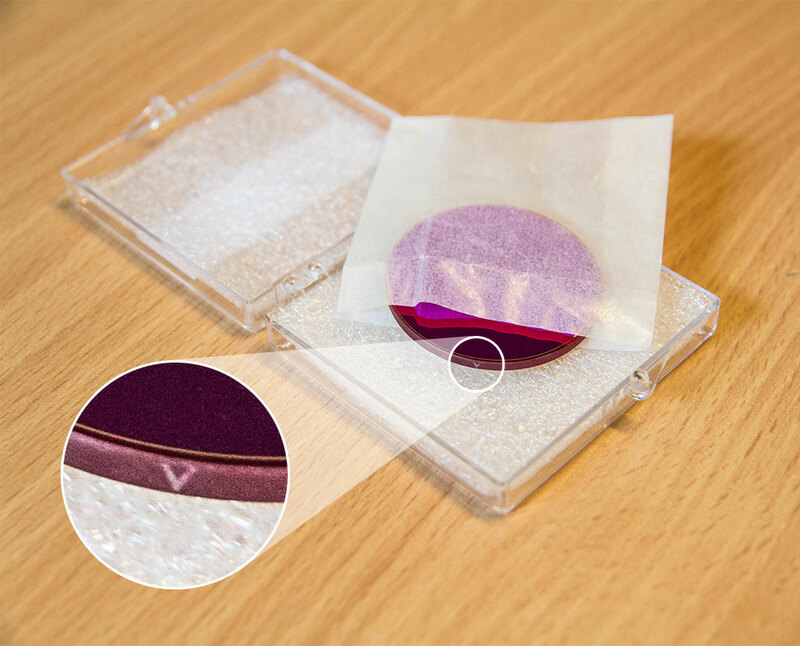 All Baader filters are finely polished optically (increases image quality). High magnification during eyepiece projection is also possible, without reducing the sharpness of the optics. These filters can be used in the observation, by technical photography, of nature. For instance they are used to determine the health of plants. Automotive experts can examine if a vehicle has been repaired as the repaired surfaces are very clearly seen due to differing reflectance. Many other applications are still in testing. Left Picture: Dr. K. Schmitt is using our UV filters to assess the damage by disease. In this example to make the damage to Primroses clearly visible a normal daylight and a UV image are taken. Using a subtraction algorithm the difference in the image shows the damage much more clearly than in the visual image. The pictures were taken with a Nikon D70, Nikkor 105mm UV. Right Picture: I am truly pleased with the new 2" Baader U filter. I thank you and your team for making it! A TRUE MASTERPIECE ! You can see an Ultraviolet capture using this filter on a Nikon D70 camera. The car is uniformly a metallic grey under normal, visible light. The non-factory paint job shows up only under UV. This is my year round test object. With best regards, Sincerely, Vivek Iyer. The Baader U Filter is only produced in set sizes relevant for use with astronomical telescopes. However, we do produce a family of adaptor rings to mount any of our 2 inch (50.8mm) filters in front of any camera lens which has a filter thread. It is important to note that not all cameras and lenses are suited to UV photography and this could result in a low signal to noise ratio in the image produced. For best results it is advised to use a specialized camera body responsive to UV light (that does not have typical blocking filters that everyday cameras have) and a suitable UV-transmitting photographic lens which has adequate glass substrates for the transmission of UV light. Our Baader DSLR 2" filter holder (#2408166) can be fitted to most DSLR camera lenses either directly or by using lens adapter rings. See related product for more information and guidance on fitting our Baader U-Filter onto a camera lens. Using this filter since many years now, as my work-horse filter for reflected UV photography. Has hardly ever let me down, delivers excellent images, sharp and rich in contrast. Only in very difficult lighting situations (direct sunlight, metallic reflections), there is some slightest NIR leakage visible, as the out-of-band blocking is only about OD3, which in most cases (> 95% of all my work) is fully sufficient. Der Baader U Filter ist perfekt um spannende Aufnahmen der dynamischen Venus zu machen. Durch die hohe Transmission können auch mit langsameren Systemen mit langen Brennweiten sehr gute Ergebnisse erzielt werden. Der relativ enge Bandpass ermöglicht es den höheren Stand der Venus auszunutzen. Eine Empfehlung für jeden ambitionierten Planetenfotografen! This filter is great. When the atmosphere is calm, the filter delivers spectacular details of the venusian clouds.